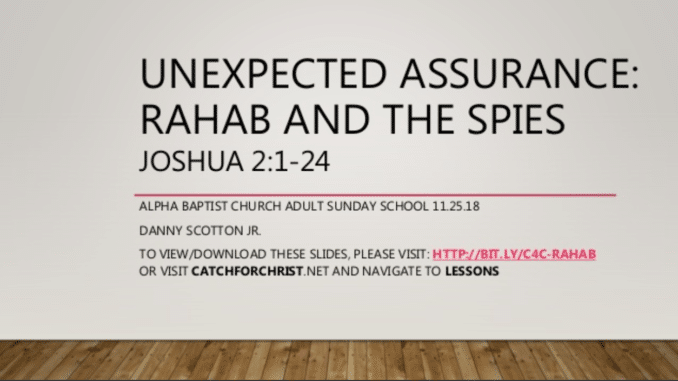 View/download PowerPoint slides of a Sunday School Lesson on Rahab and the spies (Joshua 2:1-24) below. Sources are listed in the slideshow and at the end of the page. Theme of Joshua: Israel inherits the Promised Land. Rahab provides unexpected assurance of God’s promise. Rahab renounces that of her own people and puts her faith (active trust) in the LORD – affirming Israelite prophecy, history, and theology. This account demonstrates how non-Israelites were always a part of God’s redemptive plan. 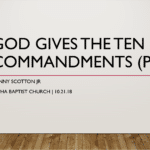 Unexpected Assurance: Rahab and the Spies | Joshua 2:1-24 Sunday School from Danny Scotton, Jr. Bowling, Andrew C. “Joshua.” In Evangelical Commentary on the Bible, 3:135–57. Baker Reference Library. Grand Rapids, MI: Baker Book House, 1995. Fee, Gordon D., and Robert L. Hubbard Jr., eds. The Eerdmans Companion to the Bible. Grand Rapids, MI; Cambridge, U.K.: William B. Eerdmans Publishing Company, 2011. Firth, David G. The Message of Joshua. Edited by Alec Motyer and Derek Tidball. The Bible Speaks Today. Nottingham, England: Inter-Varsity Press, 2015. Harris, J. Gordon, Cheryl A. Brown, and Michael S. Moore. 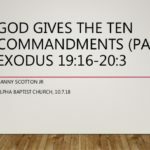 Joshua, Judges, Ruth. Edited by W. Ward Gasque, Robert L. Hubbard Jr., and Robert K. Johnston. 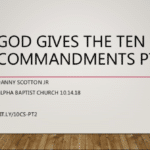 Understanding the Bible Commentary Series. Grand Rapids, MI: Baker Books, 2012. Hess, Richard S. Joshua: An Introduction and Commentary. Vol. 6. Tyndale Old Testament Commentaries. Downers Grove, IL: InterVarsity Press, 1996. Howard, David M., Jr. Joshua. Vol. 5. The New American Commentary. Nashville: Broadman & Holman Publishers, 1998. McConville, J. Gordon, and Stephen N. Williams. Joshua. The Two Horizons Old Testament Commentary. Grand Rapids, MI; Cambridge, U.K.: William B. Eerdmans Publishing Company, 2010. Nolland, John. The Gospel of Matthew: A Commentary on the Greek Text, New International Greek Testament Commentary . Grand Rapids, MI; Carlisle: W.B. Eerdmans; Paternoster Press, 2005. Osborne, Grant R. Matthew, vol. 1. Zondervan Exegetical Commentary on the New Testament. Grand Rapids, MI: Zondervan, 2010. Waltke, Bruce K. “Joshua.” In New Bible Commentary: 21st Century Edition, edited by D. A. Carson, R. T. France, J. A. Motyer, and G. J. Wenham, 4th ed., 233–60. Leicester, England; Downers Grove, IL: Inter-Varsity Press, 1994. Woudstra, Marten H. The Book of Joshua. The New International Commentary on the Old Testament. Grand Rapids, MI: Wm. B. Eerdmans Publishing Co., 1981.